OMEGA’s RHCN-3 is an economical relative humidity controller. The probe uses a thin film polymer capacitive sensor which may be mounted thousands of feet from the controller box. 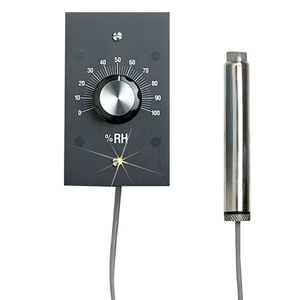 The RHCN-3 has a standard 10 mV/%RH or 50 mV/%RH (internally selectable) recorder output, and a 5 amp SPDT relay for control. The controller is suitable in such applications as baking and food processing, HVAC, computer rooms, art galleries, drug manufacturing, and many others. 참고: Comes with wall mounting bracket for probe, operator's manual.